This is a closeup of the intricate pattern and blending of different coloured fabric. This style of diamond quilt was made popular by Kaffe Fassett. 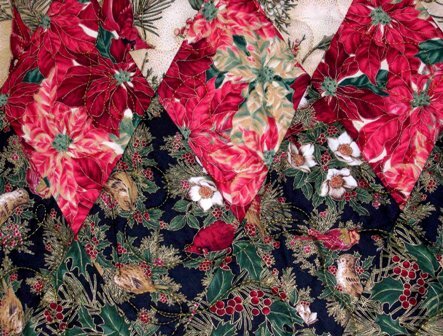 It was featured in his first quilt book "Glorious Patchwork". Fabrics are the key to this beautiful quilt. You will need fifteen different ones for the centre of the quilt as well as two for the borders. I find that the colors in one fabric will lead me to the next fabric/color and so on - they are all interconnected. In my 6 hour class you are able to get all your diamonds cut and put them up on the design wall. If you don't rearrange and play with them for too long, you can get up to half of your rows sewn. You will take your design wall home to complete the rest of the rows. If you or your group wish to take this class either during a retreat or at a local store in Vancouver, British Columbia Contact Me for more information or reservations. Finished with "Diamond Quilt"? Return to "Classes I Teach"